Have your dream wedding at McDonald’s. Is that a dream or nightmare? If you are planning a wedding, where you have the ceremony and reception is important. Right? June starts the beginning of wedding season, so I thought it would be interesting to discuss your choices and maybe add one to the mix! How many of you ever thought planning a wedding at McDonalds? Perhaps, no one! I know some people go to Las Vegas and have an Elvis impersonator marry them or a more traditional wedding in one of their chapels. The possibilities are endless! Did you ever think of McDonald’s was even a possibility? Some people love Disneyland so much, they have a Disney themed wedding. Many people include their favorite food in the wedding reception or something else in the actual wedding. If you love McDonald’s, you may want to have your wedding there. In Hong Kong, they do exactly that! Weddings are expensive and take a lot of effort to plan, so why not? What is your problem with McDonald’s as a wedding location? Do you have a spare $50-100,000 for a wedding because that is how much they cost nowadays? So you do not have that much, but you still look down on McDonald’s. Many people think of McDonald’s for the quick drink, snack or lunch on the run. The thought of holding a wedding there is not even a choice, but maybe it should be. In Hong Kong, a wedding service can cost nearly $30,000 and the average household income is approximately $27,000 per year. For a mere $1,300, you can have a wedding at McDonald’s in Hong Kong. Why not? Your guests can entertain themselves in the playground, have a tour of the kitchen and receive a happy meal! You saved a bundle! In these tough times, it is worth some consideration. Presentation is everything! If you present it as just a way of saving money, it seems a little tacky! If you explain that you always loved McDonald’s and you have a collection of happy meal toys and it would be a fun adventure, it could work. Do you agree? It may help if you are the very first to have a wedding there and you are very persuasive! Is this different from other destination weddings? You know, having a wedding at a foreign or special location. Paris, Hawaii or Aspen was already done, so you chose McDonald’s! If Paris Hilton, chose McDonald’s for her wedding, it suddenly would be “the Place”. So why not! Aren’t you just as clever and adventurous as Paris Hilton? Probably, more so! When you are rich and you chose McDonald’s, you would be thought as cool. In this economy, you should be thinking of alternative venues and be very creative in your choices. After all, if your parent’s home is big enough, that would be a choice. Public venues such as the public library, museums and city hall are used all the time. Make your wedding special by being creative not just spending a lot of money. In Los Angeles, they use a variety of venues, wineries, parks, beaches, and homes. Why stop there? I could have a beach wedding and have In-n-Out Burger cater it. It would be a hit! Why stop there? I remember frequenting an Italian restaurant years ago where they featured a spaghetti wedding cake! Imagine the possibilities! I think it adds a degree of fun to something that is serious. Shouldn’t it reflect your personality? Make planning for your wedding fun, creative and sensible. 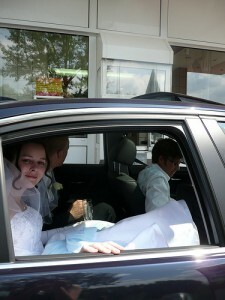 Be the first to have your wedding at McDonalds. What do you think? Let me know in your comments. Have your dream wedding at McDonald’s. There’s a story I recently read of a guy that’s been eating 2-3 Big Macs per day for the last thirty years or so. I could see him maybe making a play for this, but to the general masses, I’d say it’d be a pretty tough sell. Still, stranger things have happened. This article was intended to be provocative and do more than a gesture! I hope you are at least talking about it. Although McDonalds may be a n extreme, I am suggesting alternative venues. Weddings are so expensive and a creative choice may be better and less expensive. Maybe, I am just starting the conversation for other s to continue. Is this a service McDonald’s locations actually offer? How’d you come up with the cost of $1,300? I’d prefer to have a ceremony in my house — but if cost is the issue when avoiding $50k o $100k weddings, I”m sure there are better cheap choices than a fast food joint. This is offered in Hong Kong! The cost also comes from there. When I read the article, I thought I could use it as a provocative conversation starter. I really believe in alternative venues versus spending $50-100K for a wedding. My first thought was – come on Krantcents! You put up good stuff, but Mc Donalds? Really? Then, I saw where you’re going with this. What’s memorable and special doesn’t have to cost a fortune. It could be kitschy and unique, and perhaps be a great event in its own right without the big expenditures. Thinking expansively is always a good thing! Good point on how if the right celebrity got married at McDonalds, it might become fashionable. Stranger things have happened! It’s not that crazy compared to what some people do. I know In-n-Out burgers are big hits when served at private parties and receptions. Too often, we are locked in to the traditional wedding! I wanted to get everyone’s attention to suggest alternatives. Weddings do not need to be expensive to be nice, especially since many brides and grooms are paying for it. Thanks! I was starting to think some people may not get it. I love to take a different twist (POV) on normal things. It makes it more interesting. ehh… I can’t imagine having my wedding reception at McDonalds. And this is coming from someone who had theirs at the clubhouse of a mobile home retirement community. haha.. maybe I should have had McDonalds cater it. I was just trying to get everyone’s attention and get you to use your imagination in an alternative venue. I would probably go for cake and punch if my budget was tight versus a “McDonalds” type place. My husband would not go for it :). But myself, I think it’s a cool idea! I like the way you framed it as being unique! I do not like the idea of spending a fortune on a one day event! It is unique enough to start a discussion! If I were planning a wedding today, I definitely would consider alternative venues and serve something interesting. I have been to so many weddings where they all seem the same. I don’t think my parents would have gone for this. Not refined enough for them. It’s a cool idea though. Even if MCD’s wasn’t your choice I am sure there are other places where you could get married. It was intended to be provocative enough to get you to think about alternative venues. I’m all about destination weddings, so sure! Of course i don’t think my wife would’ve gone for it. Although McDonald”s is an interesting location, I was trying to catch everyone’s attention. I was suggesting alternative venues that may be less expensive and memorable. You would have to check with the Hong Kong McDonald’s. Venues like McDonald’s is an alternative, but there are many ways to keep the cost reasonable and still make a terrific wedding. I don’t think I would have my wedding at a McDonald’s. However, I MIGHT consider some place like a Culvers, Kopp’s, some really GOOD Italian restaurtant, or even at an Arby’s! (For those who do not livein Wisconsin, Caulver’s & Kopp’s are both burger & frozen custard places, & Arby’s is a place famous for their roast beef sandwiches. Similar to McDonald’s & their burgers & fries, but Arby’s has much better food!!) That is just if I wanted to have it at a restaurant or some sort of eatery. Otherwise, I would have it either on a beach, on a beautiful day, or in a park, or maybe even do something WILD & CRAZY, like have everybody dress up in weird. odd-ball clothes in some theme. Like clown clothes/costumes, or for a certain theme like dressing in camoflage. The possibilities are ENDLESS!!! The objective to my article was to get everyone to be more creative in their choices. Weddings should be memorable for more than how much you can spend on a ceremony or reception. I think personalization is a good way to do it.